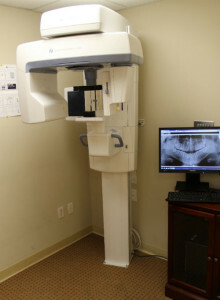 We can take your annual x-rays without causing you to gag! Do you gag when having annual x-rays taken? 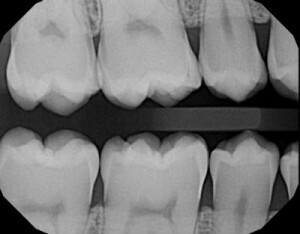 Do you have a large torus or tori that make intraoral x-rays painful and unbearable? Is your child able to tolerate a cleaning and fluoride but unable to handle radiographs? You are not alone! A small but real percentage of all dental patients suffer from this. And now there is a solution. We are the only dental office in Orange and one of the few dental offices in the Greater New Haven, CT area with the technology to take extraoral bitewings. In extraoral bitewings, you simply close your mouth on an object the size of a nickel. That nickel size object goes between your front teeth only. Nothing goes on your palate nor your tongue nor the floor of your mouth. It is as easy as sipping on a straw. No true “gagger” has ever gagged while having these types of x-rays taken at our office! When you are ready, our ultra-modern Instrumentarium machine rotates around you and emits low-dose signals focused precisely on the oral cavity to construct the image. The amount of radiation necessary is about the same as regular digital x-rays and still far below that of traditional film based radiographs. The image is constructed and analyzed by our dentists Drs. Nicholas and Carla Calcaterra and hygienists Crystal and Toni. Call us to learn more about this exciting technology unique to our practice or visit this page to request an appointment.